Fundraiser: Most Important Message from E-Democracy this Decade, Donate Today, Thank You Supporters was written on December 31, 2014 and filed in All, Lessons. « « Year-End Appeal – Your Support Counts! We broke our record for the number of donors in one year with 184 contributing so far in our end of year pledge drive. We’ve raised $6,684 on our way to meet our essential goal of $10,000 US. If you haven’t donated, please join your neighbors/neighbours who are standing up for community connections that matter online. From our new friends in Framingham and new participants in Saint Paul to long-time Minneapolis members to global supporters of our knowledge sharing efforts, together we are making this happen! Donations to our non-profit are tax-deductible in the U.S. and depending upon tax laws in other places. You may donate anonymously or set a recurring regular donation. The $10,000 will cover our bare-bones technology and help desk costs for all of 2015. This directly supports your online community forum and your awesome local volunteer. I will personally match the first $5 of every donation made in the next 48 hours. As our major grant funding for forum work is now finished and we see no grant opportunities for our vibrant online forum work, all forums must cover their real costs going forward. You make it happen by participating in local public life online. Together, led by local volunteers, we do this with an inclusive spirit to make our communities more open, friendly, and proudly better places to live. As a Midwesterner, I honestly get extremely uncomfortable asking for money. 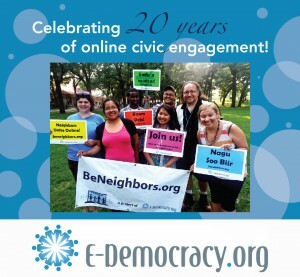 For the first decade of E-Democracy, I and many others simply donated our time – lots of it – to this digital era civic cause. We innovated with the world’s first election information website and the local online town hall using real names a decade before Facebook. In our second decade, our tech improved and we went open source. We expanded from two city-wide online town halls to dozens of very local community AND civic life online forums attracting over 25,000 forum memberships. Heck, combining our global convening and knowledge sharing on all things e-democracy and open government, we even received White House recognition last year. I’ve personally entered an E-Democracy phase informed by an exciting community life with a family – a wonderful wife, a house and two cute kids – that connects so well with our neighborly focus. I feel connected to my local community like I could have never imagined. We attracted small grants and an Ashoka Fellowship that allowed me and others to go from subsidizing the organization to actually working for E-Democracy. Then over the last three years the Knight Foundation (after five years of pursuit) invested in an audacious and unparalleled inclusive community engagement online effort. We thank them for all of their support. We’ve sought to expand Neighbors Forums across all of Saint Paul that actually include ALL kinds of residents including lower income neighbors, people of color, immigrants, renters, older and younger residents, etc. The $625,000 we’ve been able to invest in online community engagement has focused on Saint Paul but it benefited our entire network. It is also generating lessons of interest to community builders and democracy activists around the world (from Finland to Estonia to the United Kingdom). The exciting participant survey results are coming in from Minneapolis and Saint Paul with over 1,350 responses! They show great comparative success in reaching the broader local community with inclusion in Saint Paul. Door to door worked. Community festivals worked. Working with two awesome summer outreach teams that spoke ten different languages total over two summers was amazing. The dedication and perspiration of young people who once lived in refugee camps in Kenya and Thailand to an African-American Grandmother homeless and living with friends when we hired her was was amazing. The survey tells us that more active your forum is the more you are actually satisfied with your community as a place to live. Wow. Because of your forums directly, more of you attend community events (41%) or meetings (28), visit local businesses or hire neighbors for odd jobs (43%), do favors for neighbors (22%), donate to local groups (10%), contact elected officials (18%), sign petitions (16%) or work for local change (15%), or volunteer in the community (8%). This is above and beyond the many who said they already did these things and did not credit the forum for an increase. Our members are community builders. In fact, on our four super active forums in South Minneapolis 70% agreed that because of their forum, they are “more satisfied with my local community as a place to live or work.” On our less active Saint Paul and Minneapolis forums, the average who agree with this came in under 50%. Notably however, those who better represent the diversity of Saint Paul that we signed up at their door reported in with one of the highest percents strongly agreeing with this statement – more so than all but one of our super active forums! Building on our base, the next big challenge we attempted to present in over a dozen grant proposals to local Twin Cities foundations was how to build on this inclusive base of participants. The honest truth is that on our rocking South Minneapolis forums, where most people were invited by neighbors off-line, we have a vibrant week’s worth of activity in a day compared to our forums in lower income areas built with in-person outreach. Forums will be used differently and even have a bigger social impact where community news is less accessible, but we need to do better. Having important inclusive engagement work to do – that is fundamentally charitable in nature – on likely the world’s most representative local online forums doesn’t make funding appear. With the shrinking pool of community engagement funding, it is hard to compete with so many compelling needs that are far less speculative than our online engagement approach. Today, we are innovating in the face of private resident-only online models (aka gated communities) that exclude our community’s civil servants like our crime prevention officers, library and park staff etc., small businesses, journalists, places of worship from full online participation. Efforts like NextDoor have attracted $100 million in venture capital. Today, Facebook Groups now work a lot better and Facebook has a near monopoly with online engagement but share no revenue with those seeking to do more than just connect the easiest to gather in our communities via their tools. From printing flyers to going door to door, those activities have real costs. While we’ve been told that national foundations figure the market is taking care of neighborhoods online, we see reinforced barriers and enclaves emerging that connect neighbors who are the most similar. We see governments cutting themselves off from direct citizen engagement that our very public community forums offer. This may be the Silicon Valley vision of neighborhoods, but it doesn’t need to be ours. As location based advertising grows on Facebook and likely gets turned on with NextDoor, we fear for our cherished neighborhood press that is vital to community information and local government accountability and engagement. Where we are strong now, where we have a foothold, in an new era volunteer energy, we can do something different. We must. Our non-profit, community-driven network touches the lives of thousands of people everyday. Within our network are ideas and passions that will sustain us. We can also share our lessons so that those who love their neighborhood Facebook Group or NextDoor community can step it up with inclusive in-person outreach to build stronger communities for all. In fact, we see engaging other communities via multiple platforms as a good path to greater social impact while still innovating within our base. Core costs – real money, but under 50 cents a year per participant! We must raise $10,000 to cover our base technology and help desk costs for 2015. We literally make over a million individual community connections via email every year. We don’t have a fancy Facebook-like “filter bubble” where a computer tries to send you only the community messages in which it thinks you will be interested. Our embrace of active community serendipity has a real cost. Over the last five years we’ve carefully built up a reserve of around $10,000 from fee-based contract work, public speaking, etc. So, this year we have the time to “right size” our organization costs, increase the role of volunteers (Become one! ), etc. I am committed to our efforts, but when it comes to our community forum work it will also become again a volunteer effort that generates amazing community value for the effort. Ideally we will build on our open source approach and find creative ways to cover the real and increasing costs of our technology independence (now $6,000 a year up from a fairly subsidized $2,000 a few years ago via our OnlineGroups.Net partner who keeps our service up 24 x 7, 365 days a year). I will personally match the first $5 of every donation we receive in the next 48 hours. While big donations are important, setting a recurring donation of $25 a year or more will shorten our yearly pledge drive. If we don’t see funding opportunities to subsidize our forum network, you might be asking what other plans do we have to pursue our broad online civic engagement mission? Expand global knowledge exchange on open government and civic technology – Our new Open Government and Civic Technology Facebook Group has rocketed to over 2,700 members from 100+ nations. We seek sponsors to grow this group to 10,000 participants from all nations and add a weekly “best of” email newsletter along since our our long-time Democracies Online Newswire service. Innovate with Open Twin Cities – We’ve served as a vital incubator for Open Twin Cities, which is emerging as one of the nation’s leading local Code for America Brigades. With partners, we are seeking to be one of three cities nationally funded to use open government data for social impact engaging and serving lower income communities. The national funder will require local funders to match. Stay tuned. Online engagement and outreach – We are being contracted by mySociety to lead creative online engagement efforts within the global Poplus federation. Based in the United Kingdom, mySociety is one of the world’s most respected and innovative civic technology initiatives. We will be fostering engagement in their online group and reaching out nation by nation, city by city to technology developers and democracy builders to further this truly next generation sharable technology components approach to sharing democratic innovations across borders. Civic technology and open government “test bed” – Leveraging perhaps the world’s most representative base of online civic engagement participants in our most active local areas, we see an exciting opportunity to build on the experience of helping test the Kettering Foundation’s beta online deliberation platform. As someone from Google once said to me, it doesn’t do any good to only test civic technology with early adopters who already show up. With thousands of users not locked into a proprietary platform, we have some very unique flexibility. If someone wanted to test a civic app with immigrant youth for example, we have the trusted community relationships to foster meaningful engagement. Neighbors online and real life community building – We are exploring, with the University of Pittsburgh and potentially other partners, a research grant proposal to bring neighbors online down to the block and building level within our strongest neighborhoods to develop knowledge and research on what works build bridges from online activity into off-line asset-based community connections, social capital generation, and more. As the only open source, non-profit, public life online civic engagement project with online exchange in the Creative Commons, we see huge potential in being both an authentic local-up civic engagement project and a global engine for knowledge generation and lesson sharing. In fact, it is our view that had we not built in wide lesson-sharing into our Knight-funded BeNeighbors.org effort, it would be hard to justify the resources invested. If accessed, our lessons will help civic technology projects everywhere be far more effective with the inclusive outreach needed to be far more representative in their work and not just further empower the already powerful. We excel at convening and hosting online exchange be it in a neighborhood or in a global online community of practice – we seek to help other organizations meet their civic goals online. In general, we expect our future revenue to come from projects and other fee-for-service work. The era of the big grant is likely over. That said, should a door be opened or an opportunity appear, we have no shortage of big ideas from 3333 Community Sparks to Open Groups for Internet freedom to launching a collaborative effort to promote inclusion across the civic technology and open government field to proposed Open Minnesota legislation to smaller scale efforts to build on our base ideas like an online emerging leaders network led by immigrant across ethnicity led by the kinds of young people who led our field outreach to collaborating with groups like the Somali youth arts group Kajoog to foster inclusive participation on our Seward and other forums. We do not have a shortage of ideas that seemingly do not fit the priorities of funders NOR are they appropriate to fund with donations meant to support the core needs of your local forum. The reality is that community-based foundations, who care deeply about inclusion and equity, may well think of technology as by its nature an exclusive tool or are not comfortable with our integrationist, multi-ethnic approach. Or as they say, we have hundreds of applicants and fierce competition for resources. National foundations want to fund national efforts that can “scale” or they want skip ahead and focus online tools on national decision-making and addressing partisan gridlock rather than fostering the widespread community engagement we see as the precursor to rebuilding democracy and civility in public life. Perhaps in time, these kinds of ideas will find a receptive ear, but not tomorrow when our well funded initiative comes to a close. It is important to note that everyday we’ve connected more people to their local communities online than the day before for twenty years. We need to keep reasonable expectations, for momentum is more important than an instant success as a non-profit. While the coming year will be challenging with many changes, that makes it a time of opportunity. Necessity is the mother of all invention, so let’s innovate together!